The current economic era is coming to an end, and over the next 30 or so years, the global economy is going to change massively, according to research from Deutsche Bank. In the bank's latest Long-Term Asset Return Study, strategists Jim Reid, Nick Burns, and Sukanto Chanda argue that the current economic age, which began sometime in the 1980s, has been characterised by globalisation, and a huge change in the world's demographics, which has boosted growth and increased productivity. However, that era is now at an end, and the world is staring down more than three decades of subdued growth, lower profits, higher inflation, and dwindling global trade as we adjust to a shift in demographics across the planet. "In the modern era it seems that ever since the beginning of the 1980s the global economy has been dominated by globalisation and also a complimentary and massive change in demographics. This has had a profound impact on the global economy at a macro and micro level. It’s also had a huge impact on asset performance. We will argue that this era is close to being over and the economic, political, policy and asset trends that accompanied it could soon start to reverse." Essentially, Reid and his colleagues argue that the world has reached a demographic peak. In the past 30 years a perfect storm of factors — China reentering the global economy in the 70s, the fall of the Soviet Union, and to some extent, the economic liberalisation of India — added more than a billion workers into the global labour market. 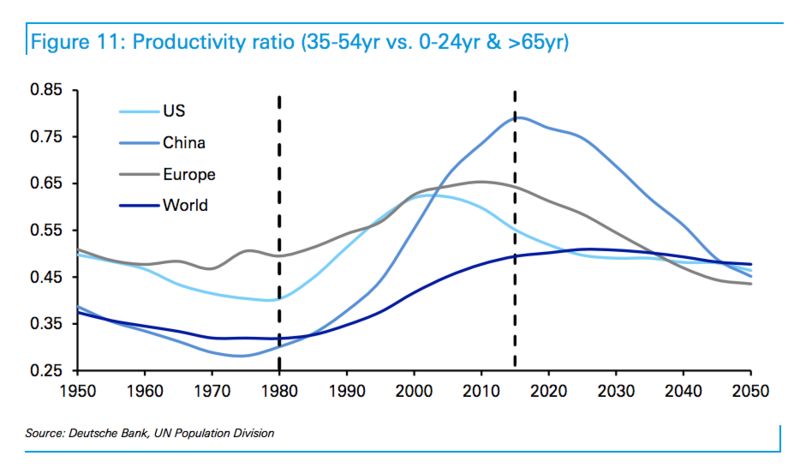 This, Deutsche notes "has coincided with a general surge in the global workforce population in absolute terms and also relative to the overall population, thus creating a perfect storm and an abundance of workers." However, now we've hit peak, what stares the world down is a fundamental shift in our economy, moving away from the globalisation and the rapid expansion that characterised the pre-financial crisis years, and towards a steadier, far less exciting economy. "With demographics deteriorating it seems highly unlikely that the next couple of decades (possibly longer) will see real growth rates returning close to their pre-crisis, pre-leverage era levels. Obviously if there is a sustainable exogenous boost to productivity then a more optimistic scenario (relative to the one below) can be painted. At this stage it is hard to see where such a boost comes from – and even if it does, time is running out for it to prevent economic and political regime change given the existing stresses in the system." The dominant themes, until the end of the next era in around 2060, will include lower GDP, higher real wages, higher nominal GDP (for most), greater controls on immigration, higher taxes for the wealthy, and lower levels of international trade. Deutsche Bank however, is at pains to point out that this fundamental change of economic cycle is nothing new, and argues that since the middle of the 19th century we've seen several waves of economic change. "In relatively modern economic history we saw the first wave of globalisation between around 1860-1914; we then saw the interwar period which included an ill fated return to the Gold Standard between 1925 and various points in the 1930s depending on when individual countries subsequently left. Then post-WWII, we saw the Bretton Woods system that lasted around a quarter of a century (1945-1971); and this was followed by the high inflation period of the 1970s. You can break up economic history into alternative distinct periods but these broad eras have shaped economies, politics, policies and asset performance." Deutsche Bank is certainly not the only institution or individual suggesting that we're staring fundamental change in the global economy. Soon after the UK voted to leave the EU, Barclays noted that the global economy is coming to a major crossroads, while Mohamed El-Erian, the former CEO of the Pacific Investment Management Co. (PIMCO) and current chief economic adviser to Allianz, sees a major "T-junction" in the global economy within three years. "The road we're on is coming to an end," El-Erian told reporters in London earlier this year. There is also an increasing swell of feeling against the neoliberal economic consensus, that has dominated thinking since the years of Reagan and Thatcher. In August, Nobel prize winning economist Joseph Stiglitz told Business Insider that: "Neoliberalism is dead in both developing and developed countries." Stiglitz's view is one echoed by many within the IMF, traditionally a great bastion of neoliberalism. Writing in a blog post in May, three economists from the IMF — long one of the greatest champions of the neoliberal consensus — questioned the efficacy of some aspects of it, particularly when it comes to the creation of inequality. "The increase in inequality engendered by financial openness and austerity might itself undercut growth, the very thing that the neoliberal agenda is intent on boosting," Jonathan Ostry, Prakash Loungani, and Davide Furceri argued. "There is now strong evidence that inequality can significantly lower both the level and the durability of growth."